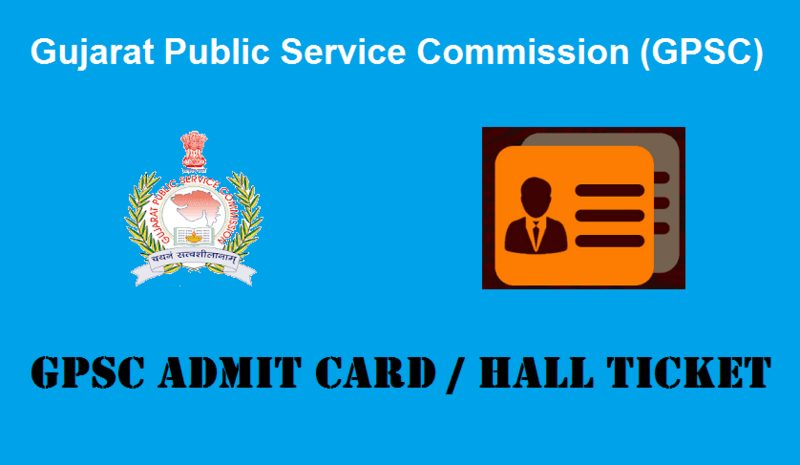 Gujarat Public Service Commission or in short, GPSC to publish the GPSC Admit Card 2019 for various latest notified posts such as Paediatrician, CDPO, Veterinary Officer, Principal, Research Officer, Asst Engineer (AE), Deputy Director, Professor, Translator and a couple more. The admit card for the Primary Test (Written Examination) will be uploaded on the OJAS GPSC’s official website gpsc.gujarat.gov.in. And notification of the same is also to be available on Gujarat PSC Recruitment Portal. The admit cards for GPSC Paediatrician & Other Recruitment Examinations will be providing the significant details to candidates such as Venue, Date and Time of the exam. Check updates here about the Gujarat PSC Hall Ticket 2019 from time to time before the examination is conducted. Candidates to please note that the hall tickets for the written examination for GJ Child Development Project Officer (CDPO) and additional recruitment drives are about to come out 07 days prior to the primary test. A huge list of recruitment posts would be filled through this huge GPSC Recruitment. The respective download link for admit cards is to be provided below at the end of this page. You can see above, the Gujarat Public Service Commission (GPSC) has announced the exam dates for the Paediatrician, CDPO, Veterinary Officer, Principal and various other posts. Now, The candidates will be invited to download their Gujarat PSC Exam Call letters through OJAS gpsc.gujarat.gov.in. The admit cards for GPSC Primary Tests will be available for downloading only for a limited time period. And after the expiry of that particular time, no candidates will be able to access the admit cards. As per reports, thousands of candidates have applied for Gujarat PSC Paediatrician posts. And all of them will now attend the GPSC Preliminary written test which is scheduled by the examination team of Gujarat Public Service Commission. Candidates must read the instructions for the exam as soon as they hold the question paper & answer sheets. GPSC Admit Card 2019: CDPO, Paediatrician, Principal etc. Candidates are advised to download the GPSC Hall Ticket 2019 and print the same at earliest possible before the exam day. GPSC Recruitment Exams for CDPO, Principal, Paediatrician, Veterinary Officer and other vacancies would be conducted as soon as possible. So, Job Applicant whose job application is submitted as a valid entry into recruitment can grab the same user login credentials. Candidates would require GPSC Login / Registration ID or Roll number for downloading the hall ticket from the GPSC Site. Hall Tickets for individuals who are not required to participate for the written examination will not be issued any. In last words, it is advised to carry GPSC Admit Card 2019 along with an additional photo Identity so that you can take a hassle-free examination. The full notification about Gujarat Public Service Commission’s Assistant Engineer Exam Date along with other recruitment details is now available at gpsc.gujarat.gov.in. According to the timetable, the combined screening test (written exam) will be conducted according to the fresh schedule. While the interview exam will be held for the shortlisted candidates of written test. For the purpose of conducting these exams, GPSC AE Admit Card 2019 will be made available for those eligible ones who got accepted during the online application process. These candidates can download their GPSC Assistant Engineer (AE) Hall Ticket 2019 with the help of their Gujarat PSC Registration Number, Date of Birth. With the intention to invite all candidates for attending exams, the commission has mentioned a set of important instructions that can also be checked in the Gujarat PSC’s Asst Engg Call Letter. Besides the exam date, Gujarat PSC AE Hall Ticket Release Date is also important to check. All candidates must be able to know it through prior official notice. Although this may be true that the hall ticket for Assistant Engineer is made available only a few days before the GPSC AE Exam Date, without giving any prior announcement. Then again, its a candidate’s own responsibility to track gpsc.gujarat.gov.in Call Letter for Assistant Engineers. Because the officials will just do their job to upload it on the official website. Along with the obtainment of GPSC AE Admit Card, another key point is to check the other supporting documents that are required to carry in the prescribed exam centre. Check AdmitCardIND.IN Latest released Admit Cards. To enumerate, the admit cards of Assistant Engineer’s Exam must be kept secured in the first place as without this you won’t be allowed to participate. Secondly, check all the general instructions available on the e-admit card because you are bound to follow each one of it. Moreover, remember to reach your allocated test centre at the specified time and by carrying all required documents and stationery items. Along with the detailed instructions given on GPSC AE Admit Card 2019, also follow the guidelines given on OMR-Answer sheet. Last but not least, Don’t forget to mark your attendance in the sheet given by invigilator or any other responsible staff. The schedule for Deputy Section Officer/Deputy Mamlatdar – Chief Officer & Other posts has been fixed. Candidates can check this info in the table below and must download GPSC Nayab Mamlatdar Admit Card 2019 Before its Exam Date. We are talking here about the Gujarat PSC Deputy Section Officer Hall Ticket 2019 which gets uploaded at www.gpsc.gujarat.gov.in. The eligible candidates who have a valid registration number for this recruitment need to get a hold of Gujarat Public Service Commission Nayab Mamlatdar Admit Card 2018 download link. The link which is discussed here is the access link of all candidate’s hall ticket that shall go active on Gujarat Deputy Section Officer Hall Ticket Date, after its release. If your application status is accepted then you should be able to secure this GPSC Deputy Mamlatdar Call Letter 2019 through GPSC Portal. In the article below, you get the official links to access GPSC DSO Hall Ticket, www.gpsc.gujarat.gov.in Call Letter 2019 along with the exam scheme of Deputy Section Officer. Gujarat PSC will be releasing GPSC Admit Card of Nayab Mamlatdar for those candidates who are going to attend respective recruitment examination. Then, After the prelims result, the commission will call shortlisted candidates to attend GPSC Deputy Section Officer Main Exam. And the GPSC Nayab Mamlatdar Call Letter for Mains will be issued in April 2019. Appearing Participants can check updates for exact call letter release date either through this page or www.gpsc.gujarat.gov.in. This is a time when candidates are looking for the GPSC Nayab Mamlatdar Examination Scheme as the registration process for the same is over. So, keep in mind the following topics when starting your preparations. Gujarat Public Service Commission (GPSC) has got all the rights for taking care of GPSC Nayab Mamlatdar Recruitment 2019. So, candidates are required to trust only on GPSC’s official details except for the unofficial ones like there are many available on the Internet these days. Regarding the hall tickets, we must tell you that it would be available only a few days before the Gujarat PSC Deputy Mamlatdar Exam Date 2019. Visit the official website – www.gpsc.gujarat.gov.in. Enter the required details (Registration No, Password) on a login page. Submit details to view your admission letter. Print GPSC Nayab Mamlatdar Admit Card on A4 Sheet and secure it for exam day. Hey guys, What’s up? Hope you do well. So, we bring here the updates on GPSC STI Admit Card 2019 for those who have applied for the State Tax Inspector vacancy in Gujarat State. To say nothing of, the preliminary exam is scheduled and your long wait for Gujarat PSC State Tax Inspector Hall Ticket will be over soon at least 10 to 15 days before the STI Exam Date. Readers, keeping you on wait is not the intention of Gujarat Public Service Commission but making a stronger plan to conduct this recruitment is in the to-do-list of officials. As a matter of fact, GPSC is considering this job opportunity very seriously for all participants and hence they are spending the time to differentiate the list of eligible and not eligible candidates. The list where eligible and ineligible applicants details will be shared as well as downloadable via gpsc.gujarat.gov.in in sometimes prior to the GPSC STI Exam Call Letter Availability Date. The commission (GPSC) has a current job opening of State Tax Inspector (STI) vacancies. The requirement is to have any degree and also welcome freshers who are desperate to get this job. After the application dates are gone, candidates should be expecting their GPSC admit card to come down at the official site which is gpsc.gujarat.gov.in. However, the fact is the GPSC Admit Card can be issued only when the officials of Gujarat PSC completes the printing & uploading work related to it. Furthermore, until the e-admit cards are not uploaded in the candidates’ login it is not possible that it will be available for download & take a print out. Most of the times it happens that a recruiter doesn’t declare the exam date of the recruitment along with the detailed notification of vacancies. But here it is opposite to what usually happens. In short, The Gujarat Public Service Commission has announced the exam date not only for the preliminary (screening) but also for the next stages too such as Main Exam & Interview. Hence, candidates are requested to check these GPSC STI Pre/Main Exam Dates so that they can make a proper timetable to prepare for upcoming written tests. Also, it must be remembered that you still check out relevant exam notice and update because if there are any changes in the prescribed schedule then you can get its awareness instantly. The official authorities who are looking into State Tax Inspector Posts have a clear statement that the admit cards of STI Exam will be made available only for the applicants whose application is submitted successfully. So, individuals need to make sure that they have a confirmation number for their job application because without this it won’t be possible to download GPSC Admit Card for State Tax Inspector (STI) Class 3 Exam 2019. Moreover, In order to download this admit card, candidates will also need to enter their date of birth coupled with their confirmation number. After entering such required details, candidates can print their GPSC STI Call Letter 2019 (Class-III) in online mode and can check all the details about the exam schedule within this. All in all, the admit card/call letter must be grabbed for getting permitted to write the respective examination. Furthermore, visit AdmitCardIND.IN to get latest Gujarat PSC Admit Card 2019 Notifications. A call letter consists of the important details of an applied candidate as well as the examination schedule together with some important instructions to follow in the exam. Guys, if in case you forget your GPSC Confirmation Number, then you don’t have to worry as it can be retrieved through your Job Application Number or by entering Mobile Number, Date of Birth from this page.